“Sweetie pie!”, “Honey bunch!”, “Cute pie!”, a group of elementary school kids excitedly yell-out. No, they aren’t naming song titles from last month’s Valentine’s Day. They’re guessing nicknames for clementines (a.k.a. Cuties). 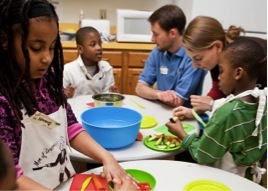 Every Friday, five Friedman volunteers get together with local elementary school students to spread their love of cooking and nutrition, one class at a time. I recently had the opportunity to sit down with Lisa Massini, Jumbo Kitchen’s (JK’s) public relations officer and second-year student in the Frances Stern Nutrition Center Combined MS/DI program, to learn more about JK. How did Jumbo’s Kitchen get started? Jumbo’s Kitchen, originally called Cooking with Kids, started in 2008 as the Albert Schweitzer Fellowship project of two Tufts medical students. These two students wanted to provide low-income students with basic cooking skills and simple nutrition lessons in a fun and interactive environment. In 2009, the project was adopted by the Friedman School of Nutrition Science and Policy and renamed Jumbo’s Kitchen in honor of the Tufts mascot. At that time we started working with our community partner, DotWell, to expand the program to more schools in the Boston Public School District. 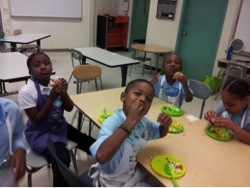 DotWell is the organization that coordinates the after-school program for the schools where the cooking classes are taught and they continue to be a generous sponsor. In 2010, 2011, and 2012, JK received a grant from the Jonathan M. Tisch College of Citizenship and Public Service that has also allowed us to continue improving the program. What is the primary mission of JK? Where do the classes take place? Can you tell me more about the students? 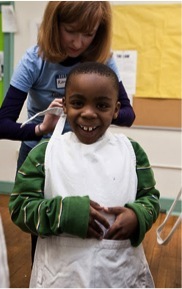 Classes take place at two elementary schools in the Boston Public School system in the Dorchester neighborhood, Joseph Lee Elementary School and Holmes Elementary School. We visit Lee Elementary during the fall semester and Holmes Elementary in the spring. Each class has about 15 boys and girls and their grade-levels range from kindergarten to second grade. What is the most impactful aspect of JK? The program is really great because it works to foster a relationship between Tufts and the under-served community of Dorchester. In my opinion, the largest impact we make is introducing the kids to food items they haven’t seen before. Each week we have a “funky” fruit or vegetable like kiwi, pomegranate, clementine, or tofu. Usually they haven’t seen or learned about the food before that lesson. When we introduce a new food, we like to engage the kids by having them make guesses about the food’s properties. We’ll ask questions like do you think it has one big seed or lots of little seeds? How does it feel? What do you think it tastes like? Do you think we eat the peel on the outside? This is just one way to make nutrition more fun and exciting for them. At the beginning of each lesson we review what we learned the week before. It’s so rewarding to get positive feedback or hear that they asked their parents to buy a food they learned about the week before. A lot of them enjoy showing off their nutrition knowledge to their parents and siblings, so impact ripples out beyond the program. JK also gives students the chance to apply their nutrition expertise, bridging the gap between the classroom and the real world. It’s also an opportunity to connect with the surrounding community and gain experience working with kids. How do you pick these “funky” fruits? We have a bank of lesson plans to choose from. We usually start with more basic foods that the kids will be more likely to try, like fruit smoothies or fruit salad. As the kids get more adventurous we advance to foods like veggie quesadillas. Last semester the curriculum culminated with tofu egg salad. All of our lessons follow the Madeline Hunter Seven Part Lesson Plan to ensure the classes are successful and run smoothly. We start with a simple objective for the lesson. Then we come up with an anticipatory set, or attention getter, to engage the students. The Friedman student leading the lesson will tell the kids what we’ll be doing that day and model it for them. Before we start, we ask them questions to make sure they understand what they’ll be doing. Then comes the fun part where we help them make the recipe. 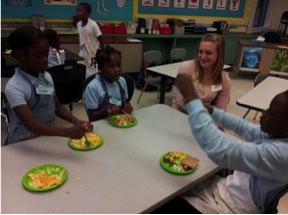 When we taught them how to use a box grater to shred cheese for the veggie quesadillas, they loved it! We had to make a rule that each student could only do 5 shreds of the cheese block so everyone could have a turn. I think they would have been shredding all night if we had let them. Afterwards, we ask the kids to reflect on our lesson to cement it in their minds and help them remember how to make the recipe. We also encourage them to make the recipe again at home with their parents or teach their family about what we learned that day. Do the kids always like the food? Not always. In addition to food and personal safety rules, we also have a rule that when we’re cooking we don’t make faces or say things like “ew” or “gross.” We encourage them to try all of the foods we cook unless they have a food allergy (instructors receive information about any food allergies before the class). Sometimes they are surprised and like the food. If they don’t, we teach them that a good chef comes up with a way to improve the recipe and we ask them for their suggestions. How did you get involved in JK and what is one of your favorite parts? I got involved because some of my fellow dietetic interns were volunteering with JK and encouraged me to join. The group needed a liaison to coordinate classes with the elementary schools so I agreed to fill the public relations officer position. I love working with children and I’ve had such a great experience this year. I will really miss JK when I graduate in May and I wish I had gotten involved during my first year at Tufts. One of my favorite parts is summing up all we’ve learned and practiced in recipes books that we provide in “swag bags” at the end of each semester. The swag bag also has a cooking tool, an interesting piece of fruit, and any photos we’ve taken. It gives the students a chance to reflect on past lessons and see how far they’ve come. All of the recipes are designed to be simple enough to be replicated at home. Last semester the kids were so excited they asked us to autograph their recipe books! What is the best way for Friedman students to get involved? We are always looking for volunteers! You can volunteer by emailing Erika Hval, our communications and outreach coordinator, at jumboskitchen@gmail.com. We teach lessons every Friday and have five volunteers for each class. The time commitment is 2:45-6pm. Volunteers carpool together to the school if a volunteer has a car. All of the schools are accessible by public transport. Do you have to be a good chef? Not at all! Students of all experience levels are welcome. There are also different roles students can volunteer for – the teacher, the co-teacher, and the assistants. The teacher leads the lesson and introduces the recipe, foods, kitchen tools, and fun nutrition facts. The co-teacher helps lead the class and picks up any necessary supplies or groceries before the lesson. The assistants help the kids during the lesson. If a new teacher is unsure where to start when planning their lesson we have a bank of recipes to choose from, as mentioned before. Volunteers are also welcome bring any new recipes or a new lesson to JK. We love having new additions to the curriculum, especially since some of the kids participate more than one year in a row. Many of the recipes contributed in the past are still in rotation. Photos by Franciel Dawes in 2012. Kate Hebel is a second-year Nutrition Communications student and a Registered Dietitian. She loves cooking and working with children. She looks forward to volunteering with Jumbo’s Kitchen this March.